When Will Companies Start Investing Their Cash? Investment in new facilities and equipment during this economic recovery has been well below the historical average. The French bank Société Générale noted in a recent report that today’s capital stock is older than at any point since 1964. Among the reasons why corporate managers have delayed these types of investments are the uncertainty created by the global financial crisis, the related weakness in consumer demand, and an uncertain and unpredictable US political environment. The level of uncertainty in the investment climate has decreased over the last few years. The housing sector continues to recover. Consumer credit levels have also improved. While the economic recovery in Europe has a long way to go, there are few that are calling for the break-up of the European Monetary Union. That was not the case eighteen months ago. The passage of the first US Federal Budget in four years also played a significant role in reducing uncertainty. While companies have been hesitant to increase capital expenditures (capex), they have been raising their dividends, buying back their own stock, and building up cash reserves. All of the above actions are generally positive for short-term financial performance. However, investing in a strategy for long-term growth is essential, failing to do so can inhibit a company’s capacity to generate sustainable growth. Companies may begin to shift their focus toward capex as the cost of their shares has generally increased along with the market. Continuing to buy back shares in a rising price environment can result in the destruction of capital. 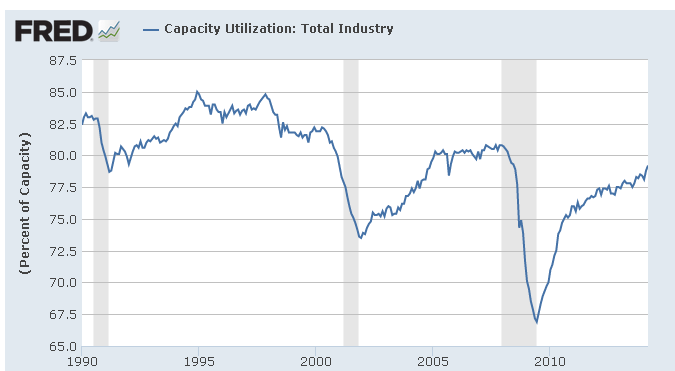 The percentage of productive capacity currently in use is called Capacity Utilization. This macro-economic measure is typically viewed as a leading indicator for capex. The rule of thumb for an increase in spending is when firms are using approximately 80% of their productive capacity. As of last Wednesday, the Federal Reserve reported that the Capacity Utilization Rate was at 79.2%. The chart below does not include the most recent data point, but does illustrate the trend over the last 23 years. We certainly cannot predict when, if, or to what degree capex will increase. It is a trend that we continue to monitor closely as we seek out companies that have strong, long-term visions for growth and the fortitude to invest in that vision.